Supplying electric services to over one million customers is no easy feat, but one U.S. energy company was able to do so thanks to Comtrol’s DeviceMaster RTS 16-port. 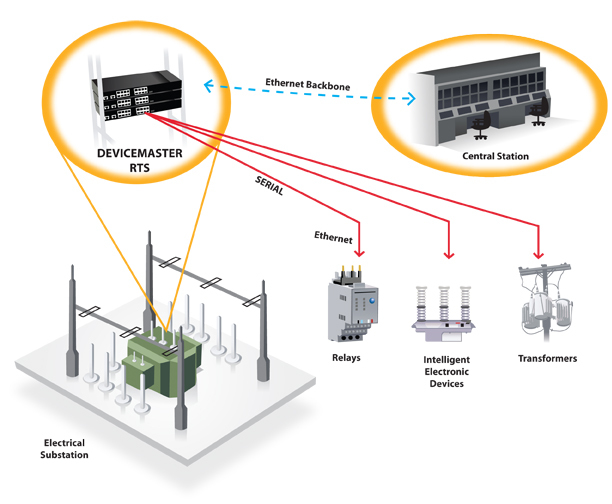 Connecting the DeviceMaster RTS to relays and RTUs (remote terminal units) gave this company control over each substation by connecting numerous devices, and gaining real-time monitoring access and control over data from each station. The information that is collected by the DeviceMaster is communicated directly to the central station by Ethernet. DeviceMaster can simplify maintenance, reduce cost-of-ownership, and translate savings and efficiencies to your company’s bottom line!